Wednesday already? 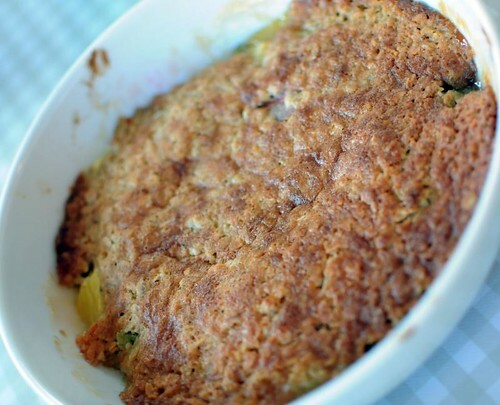 I know it's really time to share bookmarks but I haven't posted a recipe for several days and I really want to share this awesome rhubarb-pineapple cobbler with you. It's really yummy! A cobbler is somewhere in between a cake and a crumble, and in combination with tart fruit, it's really quite perfect. You can use all rhubarb or all pineapple, of course, but I liked the combination a lot. I bet some cherries would be nice in there as well, should you happen to have any! Peel the pineapple, and cut into small pieces. (I usually do this by halving it lengthwise, then cutting it again into thin long wedges, that I slice. Slice the rhubarb into similar-sized pieces as the pineapple. Melt the butter (2 tbsp) in a frying pan, add the rhubarb and sprinkle over the sugar (2 tbsp). Fry for a minute or so until very lightly caramelized. 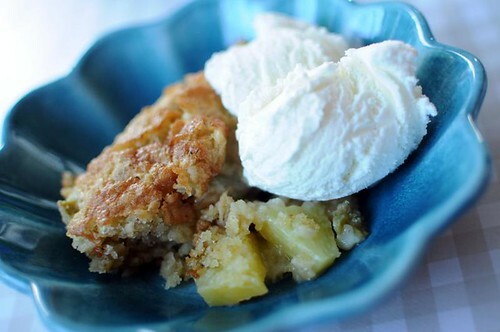 Place in a pie dish along with the pineapple. For the topping, beat sugar and butter until fluffy. Add the egg and the cream, and then stir in all the dry ingredients. Dollop the batter over the fruit. Bake at 175°C for about 20 minutes, until the cobbler is golden brown. Serve slightly warm, with ice cream or vanilla sauce. Oh nom! So very in to crumbles at the moment! Why not a cobbler? Brilliant idea! Looks delicious! Great idea! Just made your recipe but with blackberries instead of rhubarb and pineapple, delicious! Thanks! Just tried a bite of the cobbler while it is still warm and it's so tasty. My husband was skeptical about the pineapple but he loves this rhubarb cobbler.